Nashville, we’ve been noticing a trend. 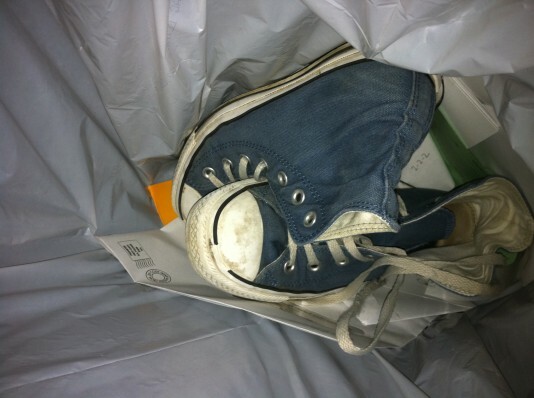 You come in wearing your most beat-up pair of Chucks, sort through our stage full of options, find your new favorite pair, and toss your old ones in our trash on your way out. Truth: we love an old, beat-up Chuck (perhaps because Rachel wears so many different pairs that she can never fully achieve that “worn-in” look). Equally powerful truth: it’s a new season, so everyone needs a new pair of shoes. Plus, rumor has it that we have a new shoe trick up our sleevethat will debut in April (and we’re having trouble containing our excitement). We may even get so excited that we start offering discounts on the lonely remaining Converse as they await a new home, but you’re going to have to follow us on twitter @twoellerabbits to hear about such things! Word to the wise: we’re running low on sizes, so if you’re ready to bring a new pair of Chucks into your life, we advise you to act fast!